The 2019 Lexus ES will keep that snarly spindle grille, but otherwise it’s shaping up to look like an alright car. And Lexus claims that it has the world’s first, production-ready Digital Outer Mirrors. But only in Japan. Blame America’s outdated regulations for this one. Now, this isn’t a totally new idea. Audi has explored it before with the E-Tron SUV concept and the Volkswagen XL1 had them, but the ones on the Lexus are supposedly the first ones to make it to production on a Real Car. The car will have small cameras in the place of traditional wing mirrors that transmit the images onto five-inch display monitors, located at the base of the A-pillars. So, you theoretically wouldn’t have to look anywhere different. By reducing the size of the wing mirrors with the cameras, visibility through the front windows should be largely improved. Wind noise into the cabin should also be decreased. 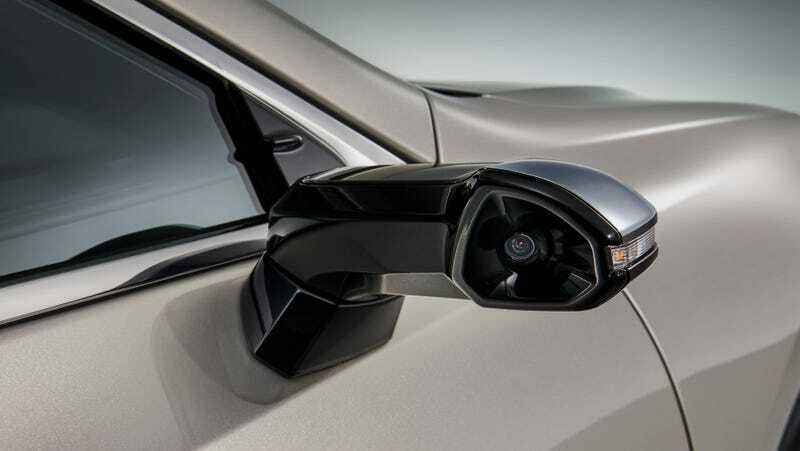 I’d imagine these wing mirrors to function similarly to Cadillac’s camera-using rearview mirror. That took a little getting used to, and I found that if I got snow or dirt on the car, the lens got blocked. Hopefully that won’t happen with the Lexus. But, the real challenge according to Fitch is trying to determine where to place the display in the vehicle so that there’s a seamless transition from driving a vehicle with a display and then without it. He doesn’t want drivers to depend on displays and forget how to drive vehicles without cameras. Reimer, too, is concerned about reeducating drivers who learned to drive with traditional mirrors. Maybe someday. But for now, only in Japan.